More than 250,000 Hoosier kids are casting their ballots today to elect their own president, governor and senator through Indiana Kids’ Election (IKE), an award-winning mock election program for grades K-12. Schools in all 92 counties are participating in today’s election, which attempts to emulate the election process as closely as possible. Students participate in voting milestones such as registering to vote on or before Tuesday, Oct. 11 and casting a ballot on Tuesday, Nov. 8 – just like their parents! Please note: Schools have until 6 p.m. today to submit their votes, so these are preliminary results. Photo caption information: Students at North Grove Elementary School (NGES) in Greenwood, Ind., vote in school-wide mock election, Tuesday, Nov. 8, 2016. Kids at NGES were required to sign in using either their school-issued lunch ID card or a handmade one; they received their “I Voted” sticker once they submitted their vote. Sponsored by the Indiana State Bar Association, Indiana Secretary of State and the Indiana Department of Education, IKE is based on the premise that voting is only occasionally done by inspiration but more often done by habit. 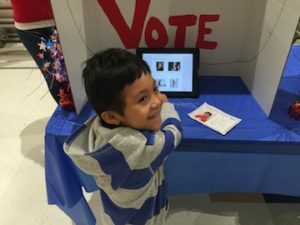 With its special emphasis on encouraging students to develop one’s voting habit at an early age, IKE attempts to emulate the election process as closely as possible. Attorneys visited classrooms as part of the IKE Speakers’ Bureau, teaching kids about the importance of voting and the election process. Also, under Indiana law, schools are required to give instruction on the election process two weeks preceding a general election for all students in grades 6-12. IKE, where the voting age is lowered to 5, helps Indiana schools meet this requirement by providing comprehensive curriculum guides, free of charge, to participating schools. The curriculum meets current state academic standards as approved by the Indiana Department of Education. The Indiana Bicentennial Commission has approved Indiana Kids’ Election as an official 2016 Bicentennial Legacy Project. To learn more about IKE, visit www.inkidselection.com. This program is funded in part by: Anthem, Duke Energy and the Indiana Bar Foundation.